Is FDA Going Too Far in Enforcing Drug Compounding Law? “Mass confusion has resulted from the usage of guidance documents, and the FDA is definitely circumventing the Administrative Procedure Act (APA) in our opinion,” Cynthia Blankenship, executive vice president of the International Academy of Compounding Pharmacists (IACP), told Bloomberg Law Oct. 19. The APA governs how federal agencies propose and establish regulations. IACP wants Congress to pass a bill ( H.R. 2871) they say will fix these issues. Since the DQSA was enacted, the FDA has significantly increased its inspections of drug compounding facilities, according to an FDA progress report. The FDA has conducted more than 350 inspections of compounding pharmacies as of Nov. 27, 2016, and nearly 120 of those inspections were due to reports of serious adverse events or product quality issues, such as drug contamination. The agency has issued more than 130 warning letters advising drug compounders of significant violations of federal law. The FDA says its oversight of compounding pharmacies is essential to ensuring patient safety and says allowing office-use compounding could lead to contaminated drug products. The FDA also says it is encouraging more compounding pharmacies to register with the agency as outsourcing facilities, which are permitted to provide compounded drugs for office use because they are subject to higher manufacturing standards. As of Sept. 8, 71 outsourcing facilities were registered with the FDA. The DQSA, which was enacted in response to a deadly outbreak of fungal meningitis from compounded drugs produced by a pharmacy in Massachusetts in 2012, distinguishes between compounders engaged in traditional compounding and outsourcing compounders making large volumes of compounded drugs without individual prescriptions. Compounders outside the scope of traditional pharmacy practice can voluntarily register with the FDA as outsourcing facilities and become subject to federal manufacturing oversight like brand-name and generic drug manufacturers. During the passage of the DQSA, Congress made clear that the ability of pharmacists to compound medications for office use should be left to states, the IACP said in a recent statement. “Technically the state law determines office use, but now FDA is holding pharmacies accountable for doing office use,” IACP’s Blankenship, said. Blankenship said the FDA has “drawn a line in the sand” so that if drugs are compounded in advance and sit on the pharmacist’s shelf, that’s considered anticipatory compounding and allowed. But, if the compounded drug is sent to a hospital, health center, or physician’s office, and it sits on the shelf of one of those facilities, they consider that office use, which isn’t allowed, she said. In both circumstances, the compounded drugs are the same in terms of quality, Blankenship said. Delays in treating patients result because health-care providers can’t obtain compounded medications to store in their offices, Murad Alam, vice chair of the Department of Dermatology at the Northwestern Feinberg School of Medicine, told Bloomberg Law Oct. 24. Alam, gives the following example: A patient needs a small skin procedure that might require a topical anesthetic. The dermatologist doesn’t know in advance if he or she will need the anesthetic. After examining the patient, the physician learns the patient in fact needs a procedure that requires a topical anesthetic. But because office-use compounding isn’t permitted, the dermatologist has to write a prescription for the anesthetic, obtain it from a compounding pharmacy, and do the procedure at a later date, Alam said. Further, only a limited number of 503B outsourcing facilities exist, and none of them might make the particular medication that a doctor needs. Dermatologists and other physicians used to be allowed to keep compounded drugs on hand in their offices to use as patients need them, Alam said. IACP also is concerned about the draft memorandum of understanding ( MOU) between states and the agency addressing the distribution of compounded drugs because it could limit patient access. The MOU describes state responsibilities in investigating and responding to complaints about traditional compounders that distribute drugs outside the state or distribute inordinate amounts of compounded drugs interstate. Blankenship said the MOU redefined distribution to include dispensing, which essentially bans office-use compounding, and historically, dispensing and distributing have been considered two different activities. In other federal laws such as the Controlled Substances Act, distribution is defined as providing medication without an individual prescription, while dispensing means providing medications pursuant to prescriptions, David Pore, an attorney with Hance Scarborough LLP in Washington and a consultant for IACP, told Bloomberg Law. IACP wants office-use compounding to be left to the states, Pore said. “States that authorize it have found ways to do it safely,” he said. IACP also is concerned that FDA isn’t getting enough input from pharmacies and providers as it implements the provisions of the DQSA. Also, the FDA has issued only guidance documents for compounding, and it should be issuing proposed rules, Blankenship said. Guidance documents hold no legal weight, but yet the FDA is enforcing every single guidance document when it conducts inspections, she said. Congress also has sent several letters to the FDA, including a letter from Reps. Chris Stewart (R-Utah) and Buddy Carter (R-Ga.) and 63 other House members, saying they are disappointed with how the FDA has implemented the DQSA’s compounding provisions. To fix the situation, the IACP supports a bill, H.R. 2871, which they say will clarify the DQSA to better align with congressional intent and protect patient access to compounded drugs. Rep. Morgan Griffith (R-Va.) introduced the bill in June. Under the bill, if state law authorizes office-use compounding then it wouldn’t be considered a violation, Pore said. The bill also provides clear definitions for distribution and dispensing, and requires the FDA to go through rulemaking under the APA, he said. The consumer group Public Citizen strongly opposes H.R. 2871 because “it would eviscerate critical patient safeguards established” by the DQSA, Michael Carome, director of Public Citizen’s health research group, told Bloomberg Law in an Oct. 19 email. “In particular, the bill would open a huge loophole in the prescription requirement for compounding pharmacies and allow any pharmacy to mass produce compounded sterile drugs for use in hospitals and doctors’ offices,” Carome said. No facility would register as a 503B outsourcing facility and become subject to federal oversight and pay fees to the FDA if they could remain a 503A compounding pharmacy and do the same thing, which is distribute nonpatient specific drugs for office use, Julie Dohm, senior science adviser for compounding in the FDA’s Center for Drug Evaluation and Research told Bloomberg Law. Outsourcing facilities that elect to register with the agency must pay an annual fee, which is $17,364 for fiscal year 2018. Small outsourcing facilities with gross annual sales totaling $1 million or less pay a reduced fee of $5,364 for FY 2018. “We obviously recognize how important it is for the outsourcing facilities to be able to meet the need for nonpatient specific compounded drugs. That’s what they were created to do, that’s what they’re allowed to do,” Dohm said. Dohm said the FDA is encouraging more compounders to register as outsourcing facilities and the agency plans to release guidance in the coming months on the current good manufacturing practice (cGMP) requirements for outsourcing facilities. Dohm said that after the DQSA was enacted, the FDA worked quickly to establish a framework for the new category of outsourcing facilities and these facilities are intended to provide greater assurances of quality to patients who need compounded drugs. 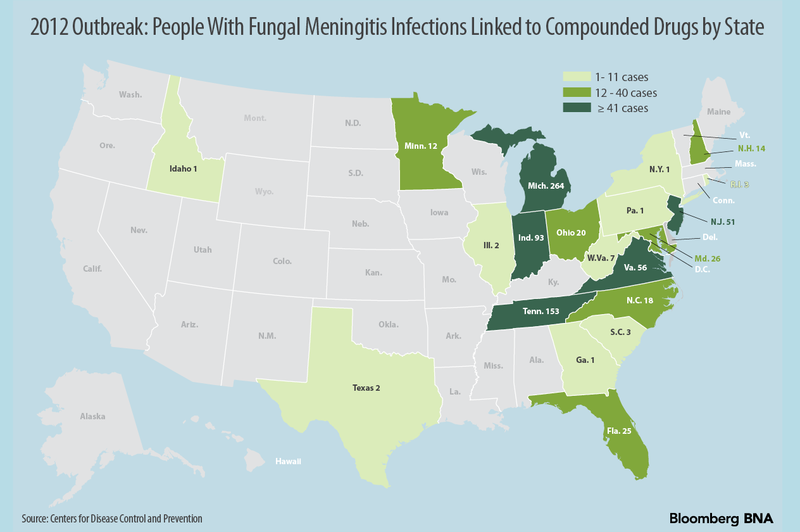 During the fungal meningitis outbreak in 2012, more than 60 people died and 750 were injured in 20 states after they took the contaminated drug products, Dohm said. The contaminated drugs were made and distributed by a state-licensed pharmacy, called the New England Compounding Center, without valid prescriptions for individual patients. “Since then FDA has investigated numerous other serious adverse events associated with poor quality compounded drugs, and in many of these cases the pharmacy shipped drugs produced under insanitary conditions to patients throughout the country,” Dohm said. For example, Dohm said the FDA has seen pharmacies with dead insects in the ceiling, pharmacies that used coffee filters to remove particulates from drug products, and pharmacy workers with exposed skin during sterile drug production. These conditions could result in contaminated compounded drugs that harm patients, Dohm said. Dohm also said the longer a contaminated sterile drug product is held by a pharmacist or physician before distribution or held in inventory in a health-care facility, the greater likelihood of microbial proliferation. H.R. 2871 is at https://www.congress.gov/115/bills/hr2871/BILLS-115hr2871ih.pdf.